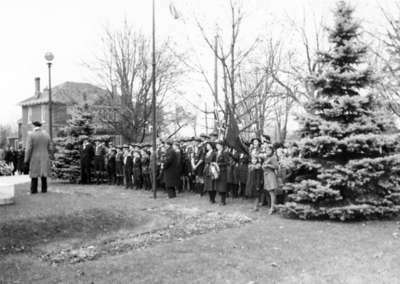 A black and white negative of people gathered at an Armistice service. This photo shows boy scouts and girl scouts of Whitby at the service. In the background at left is the residence of Mrs. Theodore McGillivray at the north west corner of Dundas Street and Perry Street. The residence of Mrs. Theodore McGillivray was demolished in 1954. Armistice Service at Cenotaph, November 1939, Marjorie Ruddy. Whitby Archives 29-004-022.